I've put in links to some of the places and services so they may help people. This does not mean however that we recommend them it's just us being factual. Flew BA from London Heathrow to Denver, Colorado USA. Amazingly got an upgrade from BA to Club World, enabling us to make use of the BA lounge at Heathrow with all free food and drink. Met with a glass of champagne onboard the Boeing 747 followed by superb service, food and drinks. A seat that was like a pod and went down to horizontal to form a bed. Arrived in Denver and couldn't get a shuttle to the hotel so ended up ordering a cab from Denver International airport to the Cambria Hotel and Suites which although classed as an airport hotel was about 25 miles from the airport! An early breakfast followed by a call to Cruise America RV Rental and a shuttle arrived at our hotel at 9:30 to take us to pick up the motorhome. Less than an hour at the rental pick-up and we were on our way in a 25foot motorhome. Headed straight for Walmart for food etc. and then Safeway for fuel. By just after lunch we were very tired as our body clocks were 7 hours adrift but we hit the open road and headed due North toward Cheyenne in Wyoming as thunderstorms hammered around the Rockies. We had pre-booked our campsite online a few months before at a site we know well and have used several times before, Tumbleweeds Campground in Curt Gowdy State Park between Cheyenne and Laramie. Had our first barbecue and sat around an open log fire until sleep quickly beckoned. It was a fine & hot sunny day but turned quite cold by evening. 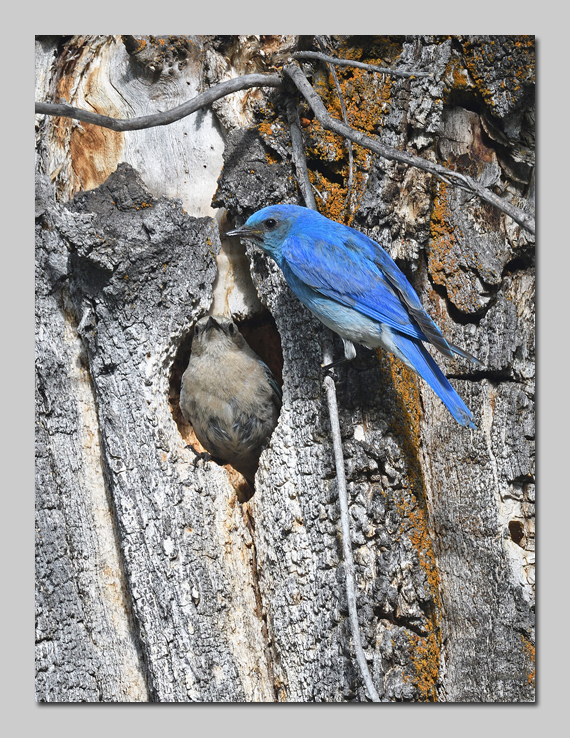 Photographed a few birds first thing in the morning in the willows around the shore and a male bluebird defending its nest site against a tree swallow. 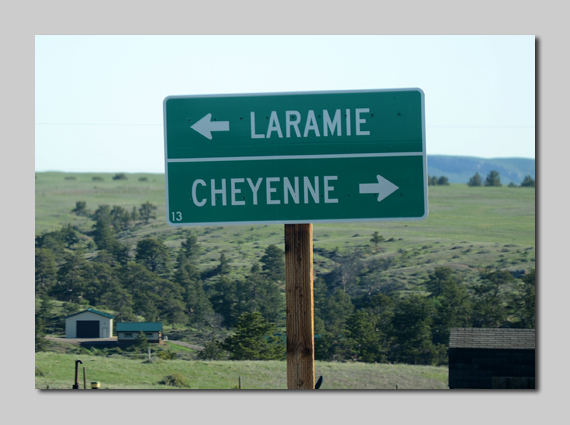 Left Curt Gowdy at 7:30 and headed West toward Laramie. Drove through the town at Laramie as I needed to fill up with fuel for 2 days of driving and saw the older part of town but there were a lot of new buildings and it looked a go-ahead city. We stopped a few times en-route before eventually arriving at Sleeping Bear Campground at Lander. We usually stay at Sink Canyon in Lander but I wasn't able to book it and was concerned it may have been busy with it being the end of a holiday weekend. Anyhow the campground was good, quiet and peaceful except for the church bells and clock which fortunately didn't ring after about 6 pm. There as a good walk along a fast flowing stream and I got to photograph some good birds along with an American Robin feeding a young one in the campground. Massive rib-eye steaks on the BBQ and a few beers around the campfire before turning in for the night. We left Lander at about 8:30 and drove across the Wind River Indian Reservation, through incredible scenery on the Chief Washakie Trail to Dubois. We left Dubois and climbed ever upward into the Rockies until we hit the snow line at the Continental Divide and 9400 feet. 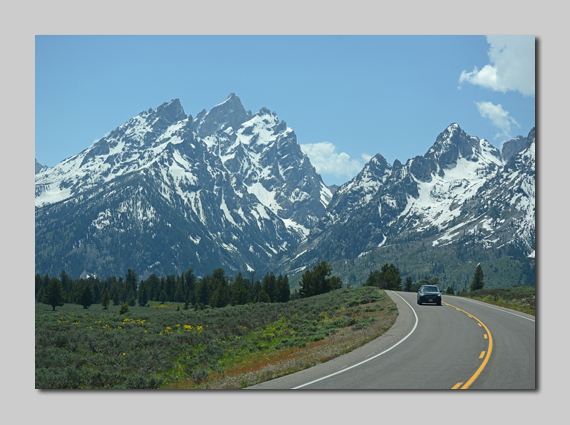 Down the other side of the mountains and into the plains and meadows of Grand Teton National Park with the snow-capped Teton mountains forming an incredible backdrop. We headed straight to the Gros Ventre campground with the hope that there would be spaces. This is one of our favourite places to camp having stayed here many times in the autumn but rarely in summer. Luckily there was vacancies so we booked for 4 nights which will then fit in with us going up into Yellowstone on Thursday as I've pre-booked for 4 nights there at Bridge Bay campground. The Gros Ventre river is very high and running an absolute raging torrent, totally different to the last time we were here when I photographed moose walking across its pebbly riffles. 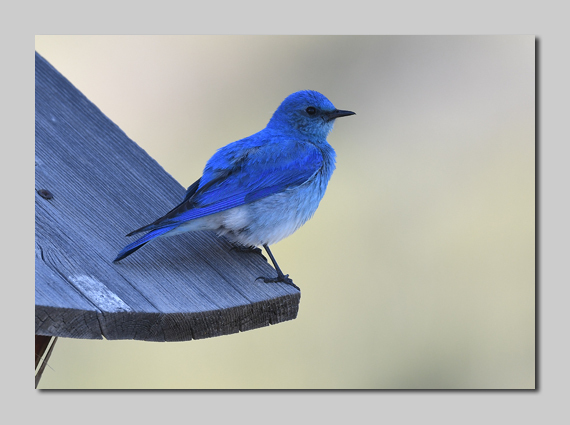 Photographed Mountain Bluebird at the campground, along with Yellow Warbler (which seem to be everywhere) before entering the Grand Teton National Park for the first time this trip. Bought ourselves an annual pass at 80 dollars which will be good for any National Park for the rest of our trip and who knows we may get across again before next June when it expires! We made our way out to the Snake River Ox-bow Bend area and then onto a bit of dirt road to a riverside area where we've stopped a few times and previously seen good wildlife. This time part of the parking area was closed off as it was under water and the rivers keep rising as the very hot days are melting the snow faster than usual. We got out the camp chairs and sat and had a picnic lunch and suddenly an immature Bald Eagle flew in and landed in the tree above us. I couldn't get a good angle on it to get a picture and then a Park Ranger drove in and the bird quickly left. There were at least 2 pairs of Spotted Sandpipers nesting in the vicinity and they were flying around calling at any avian intruder! Two Ospreys were hunting in the river and one flew into a conifer on the other side of the water and called to its mate incessantly. At least a dozen Mergansers (We call them Goosanders in the UK) drifted downstream past us, one female and the rest all males. After lunch we made our way over to the Jackson Lake dam area and saw the distant group of White Pelicans and the hundreds of Cliff Swallows nesting on the concrete dam structure. Watched Pronghorn Antelope on the sage flats in several locations and then made our way back to the campground. I had a good campfire going in the evening and some pork steaks and jacket potatoes (done in the fire in tin foil) followed by a couple of tots of something kept me going till dark. However delighted to be out photographing bluebirds and squirrels on a beautiful morning. Very hot today and a cloudless sky! We took a short ride out to Pacific Creek to have a look round. Plenty of Buffalo grazing on the lush spring grass on the way and a cracking Western Meadowlark singing on the top of a roadside post. As a special birthday trip I was treated to a visit to the supermarket! A huge Albertsons store in Jackson Hole that we've used before to stock up on provisions…..more charcoal for the BBQ, more steaks, milk etc. Oh! More beer but you can't buy that in the supermarket you have to go to the Liquor Store next door! Then out to lunch as a birthday pressie! Steak and eggs at the Bunnery in town was just what I needed. Watched a huge Buffalo bull cross the road in front of us near to Mormon Row but couldn't find a safe place to stop so left him go in the hope of seeing more when we get up into Yellowstone. The weather has started to get hot and muggy and I feel a mountain thunderstorm is due. We headed back to the campground which is still one of my favourite places to see and photograph wildlife and I checked out a possible old woodpecker hole that I found earlier to see if the Bluebirds were using it. Not that hole but in a tree behind it I saw the female bird peering from a natural hole in a Cottonwood tree. I got the camera set up and managed to rattle off a few shots although the clouds were gathering and the light was really poor….no pleasing photographers! However I got some reasonable shots and am hopeful that tomorrow morning may provide me with light in a better direction. 6pm. And the thunder is rolling around with the occasional flash of lightning and an odd shower. Gives me some time to get this blog written up and we're hoping it may well clear in time to get a campfire going later. The second time in my life I've photographed Bluebirds on my birthday……. Can't complain at that! Thunder cleared and fire lit, a few sausages and some bacon over the griddle topped off with a cold beer! I was out fairly early to suss out the Bluebird nest but the light was a bit dull and didn't get to the nesting tree till about 8 am. I got a few shots of the male bringing food to the female who I guess is still brooding eggs as he is passing her the food. Also noticed a Tree Swallow nesting in the original old woodpecker hole and a pair of White-breasted Nuthatch checking out another cottonwood for a potential site. Just in the middle of my breakfast when out of the corner of my eye I noticed a Moose running along the river's edge of the campsite less than 60 metres away from us. Managed to get a few hasty shots as it skipped and frolicked through the shallows and the willows of the swollen river. Both Linda and I then went out to the river's edge and watched it disappear from view downstream. 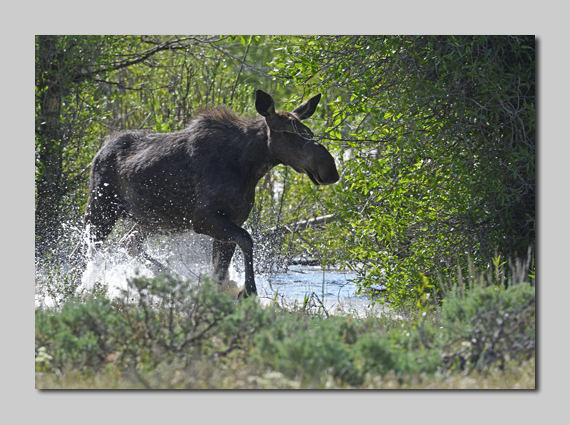 The Campground staff told me that there had been as many as 13 Moose on the campground in April. We have always been lucky to see Moose at this site and despite not getting the greatest photos of this one it remains one of the best places to see Moose in the Yellowstone Ecosystem. After breakfast we drove out of the Gros Ventre valley up to Kelly and across Antelope Flats where we came across a couple of Mule Deer really close to the road. I pulled off the road into a layby and they were walking straight towards us so setup the camera out of the RV window and got some smashing shots in great early morning light. Both had their antlers in velvet. A bit farther on we came across a Pronghorn Antelope crossing in front of us, in fact I had to stop to let it cross. Managed a few shots of it from the driver's seat! We drove up just past Colter Bay on the road toward Yellowstone but didn't see much apart from some more White Pelicans and some Western Grebes in the bay. Still very hot and difficult to spend much time out of doors as the heat and high altitude is tiring us quickly. Spent a few hours watching for wildlife from various vantage points and did see a Northern Harrier hawking the Willow Flats near to Jackson Lodge. Eventually succumbed and headed back to the campground to sit outside the vehicle in the shade… and type this! We left Grand Teton National Park and headed up the 50 odd miles North to Yellowstone National Park. Stopped a couple of times in the snow as we went over the Continental Divide …again…seems to be a thing with travelling in the Rockies! Arrived at Bridge Bay campground on the Yellowstone Lake and at 7800 feet, fortunately we'd pre-booked for 4 nights so the “Campground Full” notice didn't apply to us! After a bit of lunch we drove out to Fishing Bridge and out to Pelican Creek where we'd seen otters in the past. None this time but some good birds, Buffleheads galore, Lesser Scaup and Green-winged Teal. We then headed north and into the Hayden Valley where we saw several buffalo amongst the hot springs and elk dotted around in the open meadows. There were a load of people on the rise above the river and when we enquired what was going on, we were told there had been 2 of a pack of 4 wolves seen there the previous evening. So we found somewhere to park and got out the camping chairs, binoculars and telescope and sat in the sun until about 8:30 pm. We saw an elk and its new calf come running out of the forest and thought it may be a pre-cursor to a wolf hunt but nothing happened. We watched a buffalo swim across the fast flowing river and also spotted a Sandhill Crane but still no wolves! Headed back to the campground and barbecued a couple of thick steaks and ate them in the dark around the campfire. 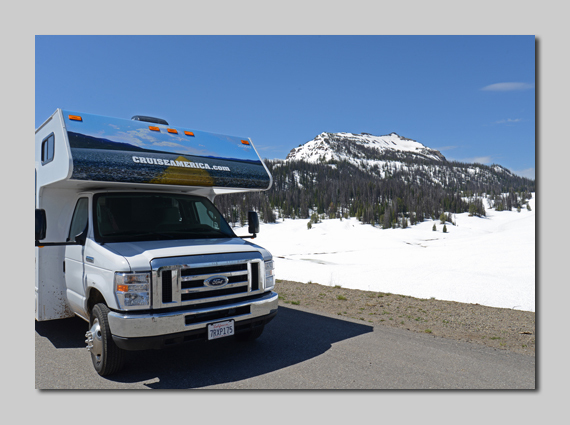 We left the campground fairly late this morning at about 9:30 and headed North through Dunraven Pass and over Mount Washburn . Stopped a few times on the mountain to look for wildlife but didn't see anything out of the ordinary. 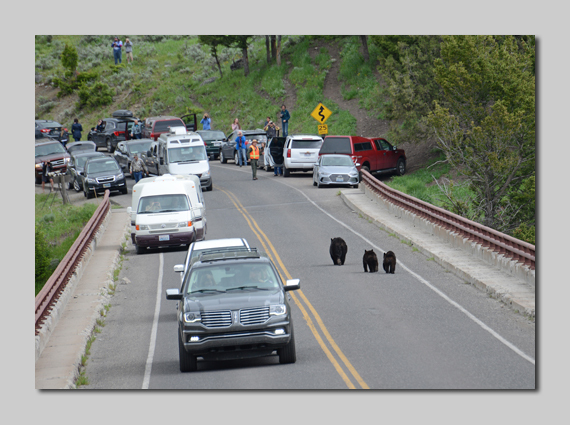 We then dropped down the other side to Tower/Roosevelt junction as we'd heard that there was a Black bear with cubs in the area. There were a couple of places where we'd seen black bears on previous visits along the road from Tower to Mammoth so we drove over that way but didn't find any. We then thought we'd head down the Lamar valley for a few hours and within minutes of turning down the road from tower we encountered a lot of people beside the high road bridge over the Yellowstone River. Sure enough this is where the bears were and a Park Ranger had stopped the traffic across the bridge as it seemed they were climbing up the steep side of the ravine toward the road. 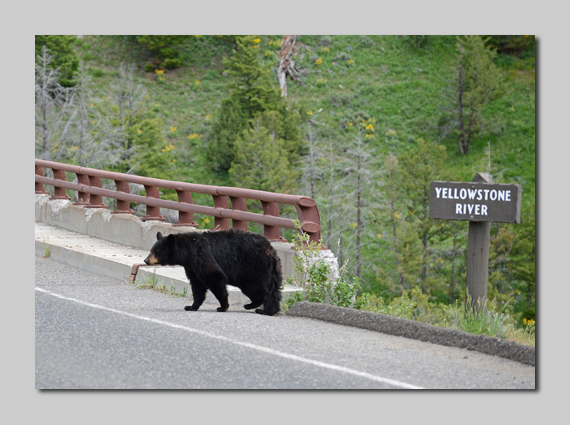 I got a few photos as they came up onto the road, a female Black bear with 2 cubs. I was thinking that they would just cross the road and carry on down the side of the river but No! They wanted to cross the river not the road so they set off across the bridge with cars stopped about halfway and people watching at either end. People were pretty good and gave them plenty of space and they left the road at the other end of the bridge to continue foraging up on the high ridge on the opposite side of the river from us. We continued down the Lamar valley and had lunch parked up near the Ranger office halfway along the valley. After watching a couple of large herds of buffalo with several youngsters we made our return to Tower but met the crowd and the bears a few hundred yards from our previous encounter. This time we parked on the side of the road and I sussed out where I thought they were going and set up my camera on the tripod and waited a few minutes before I was rewarded with some great views of both Mum and her cubs. Frame filling images in good light, although it wasn't long before the crowd picked up on their whereabouts and came to join me. We left them to it then as despite the bears treating the whole thing with total disdain it had become a bit of a circus. As we drove back towards the campground it started to rain and it gradually became heavier so it was food indoors tonight from a tin of beef stew and a chance to edit a few photos (that means DELETE lots!). 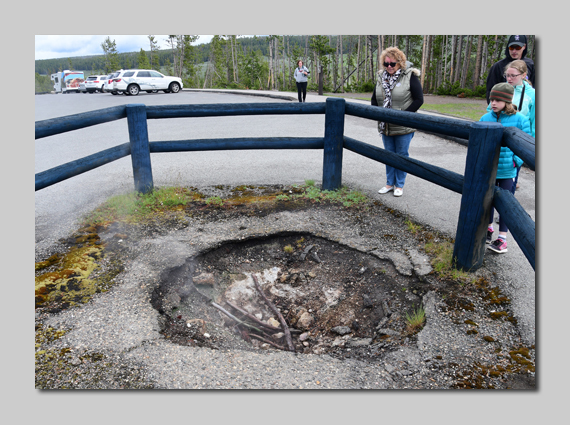 We stopped a short distance from the campground at the thermal area of mud volcanoes for a look at all the steam vents coming from the centre of the earth. One has even erupted through the tarmac of the car park! 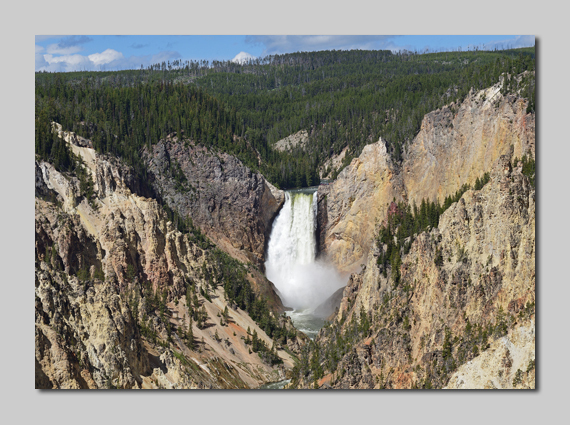 Yellowstone river thunders over the falls and into the canyon below. Very impressive and helped by the fact that the river is in flood at the moment so plenty of water being forced into a small gap and over the falls. From Canyon we drove across to Norris to check out the campground there as we will need a new site on Monday. It looked good and is a “first come, first served” site so we'll aim to get there late on Monday morning. We had lunch watching a few buffalo graze in the water meadows at Norris and also watched an Osprey hover above and a Mountain Bluebird feeding next to the camper. We the headed down to Madison Junction and West towards the West entrance, to a place where we'd been lucky with seeing otters back in 2015. Unbelievably as we left the main road onto a little riverside loop I thought I saw a tree branch rolling downstream. Closer inspection revealed 2 otters fishing in the fast flowing torrent. It has been very windy all day today and the water was quite rippled and turbulent so picking them out was difficult at first. After a while I got to the shoreline with my camera and watched the hunting for several minutes and got a few photos as well. They were slowly heading downstream so we drove to another pullout area about a half mile further down but never saw them again. 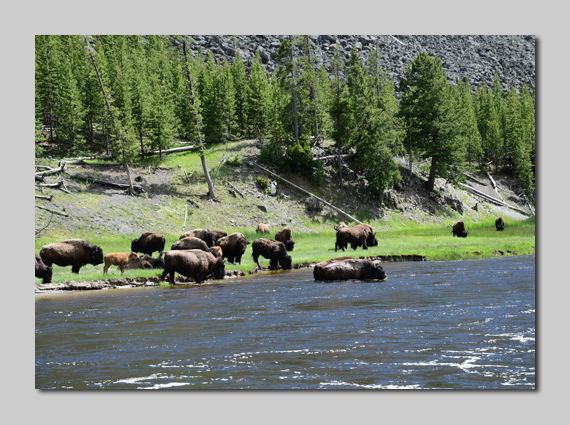 We then headed back toward Madison campground area where there was a large herd of buffalo grazing in the meadows on the far side of the river. 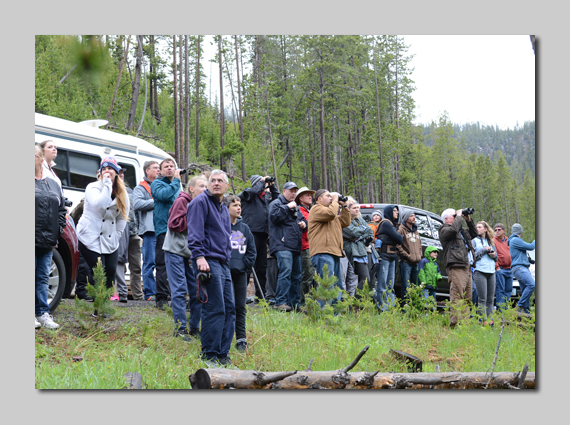 There were a lot of people there watching but we managed to squeeze the camper into a parking space and watched the herd. There were lots of young calves with their mothers and a few young bulls and what seemed like one senior bull. After a short while the dominant bull decided to swim across the river to the meadow by the road and proceeded to swim directly towards me and my camera. When he was about 2/3 of the way across I thought it best to make myself scarce so I moved back towards the trees and the road. 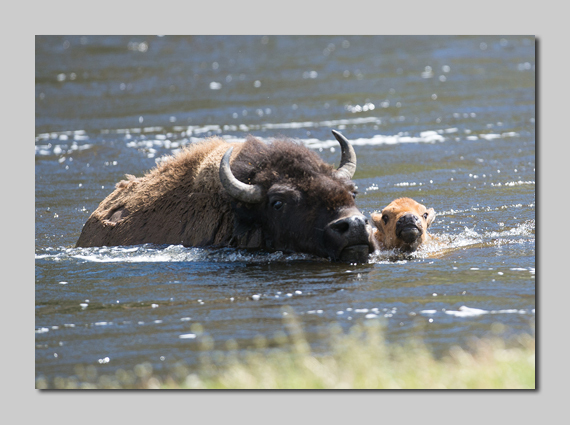 This was only the start as most of the herd then decided to follow and most of the calves were helped across by the mothers swimming alongside and upstream of them to protect them from the fast flowing current. This was some of the best photography I'd done for a long time and I took a lot of images, both close up and landscape shots of the herd in the environment. When we arrived back at Bridge Bay it was about 6:30 so we had some bacon on the BBQ and baked spuds via the microwave (all mod cons in these campers!). After tea I took a stroll around the campground trails down to the shore of the Yellowstone Lake. Here I found a young Elk buck that we'd spotted earlier. I took a few photos but I was very close and on my own and he was unsure so I let him carry on grazing on the shoreline willow scrub. 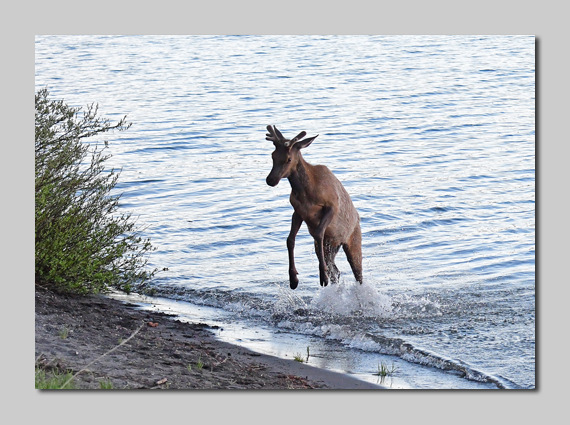 At one time he went into the water to access the willows and then decided to have a good old dance and frolic in the water with legs in the air and water splashing all around. Great to see although at about 8 pm in the evening and amongst trees the light was pretty poor and I had to push the ISO of the camera and over expose for the lake in the background. Not my best but still quite a pleasant experience being that close to an Elk. We left the campground and looked in at Fishing Bridge to fill up with fuel… very expensive here compared to the outskirts of Denver $2:77 compared to $2:13 per gallon (not litre as at home!). Picked up some food items and headed over to checkout Pelican Creek before heading off for the day. Remarkably there was a Pelican in at Pelican Creek! An American White Pelican and also thanks to Linda for spotting a Belted kingfisher! We then headed up past Canyon and over Dunraven pass and Mount Washburn toward Tower / Roosevelt junction. 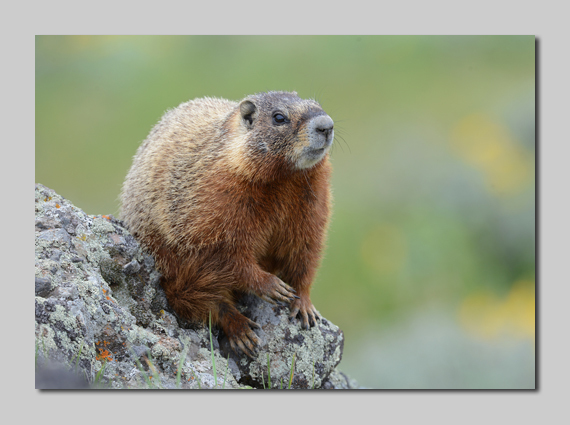 We stopped for coffee just after the summit and watched and photographed 3 Yellow-bellied Marmots lazing about on the rocks waiting for the sun to come out. Dropped down the mountain and took the turning down into the Lamar valley. There were some large herds of buffalo in various places down through the valley and when we had past Slough Creek we came across several people with binos, scopes & cameras. Guessing they were looking for Wolves we tried to park but there was no space on the side of the road so we drove on another ¼ mile and pulled off at a layby. 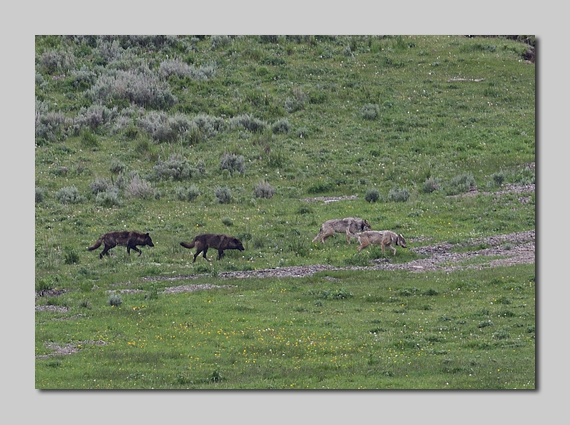 I got our telescope out on the tripod and scanned the area near the buffalo and ‘lo and behold' 6 Wolves out in the open with several playing around and a couple wearing radio tracking collars. We watched them for about half an hour and saw them playing, scratching and generally relaxing before one of the light coloured ones with a collar started off toward the buffalo. They all followed in a ragged line with the last one carrying quite a bad limp. The buffalo weren't the least bit bothered, despite them having a few youngsters amongst the group. We eventually lost sight of the wolves as they went into the sage brush beyond the herd and you had to wonder if they'd already eaten and were just sussing out their territory. We then headed farther down the Lamar valley just past Soda Butte Creek and pulled out for a spot of lunch. I got the telescope trained on the nearby mountain and managed to count at least 9 white Mountain Goats on ledges and also 3 of those had new born kids with them. 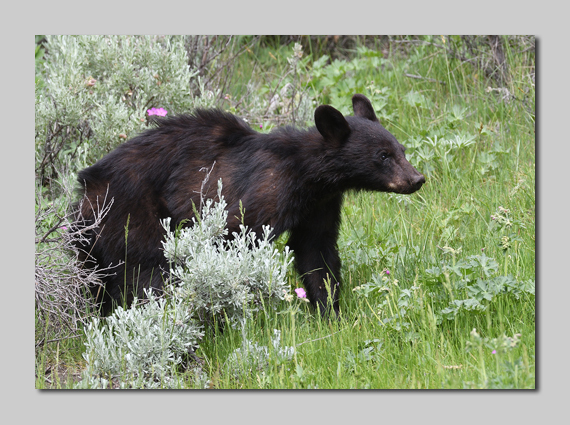 When we got back to Tower we saw the black bear female with the 2 cubs lazing under a tree in a meadow. I took a few photos but they were having a lazy Sunday! One good thing was that the Park Ranger watching over the bears showed me the nest of a pair of Great Horned Owls with 3 sizeable owlets in it. I got a few photos but it was always distant and I understand it is being monitored by the Park Service so little chance of getting much closer. As we passed back through the Hayden Valley to Bridge Bay there were a few “buffalo jams” and one “elk jam” but we did pull out and watch a pair of adult plumage Bald Eagles sitting on a bluff above the Yellowstone River calling like crazy. Whilst watching them Linda spotted a Coyote, her second for the day… but not one photographable yet! Back to the campground and BBQ'd pork steaks with macaroni! Also had a White-crowned Sparrow perched on the wood around the picnic table! We left the Bridge Bay campground this morning after a night of thunderstorms and heavy rain. 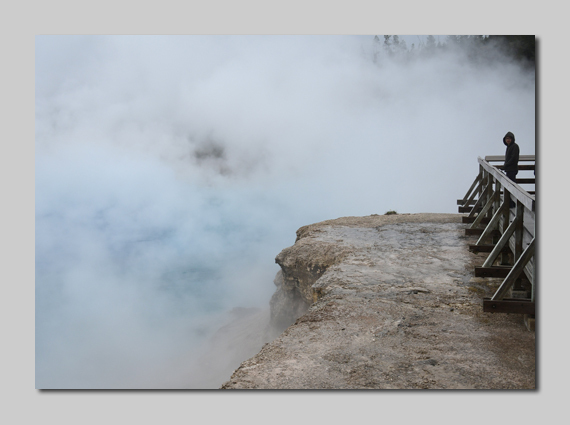 The morning however was fine with good sunshine so we stopped off at the South rim of the Grand Canyon of the Yellowstone to get a few photos of the falls from Artists Point. It was very busy with bus after bus of oriental tourists all wishing to do a “selfie” in front of the waterfall! We then drove across to Norris and booked in at the campground there for a couple of nights. We were lucky and got a great site down next to the water meadows. 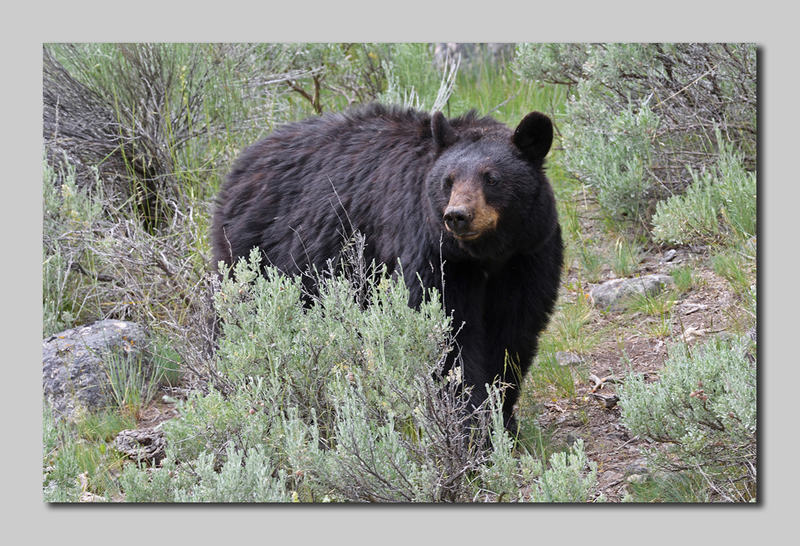 There has been a bear on the site quite a bit lately so I'm keeping the camera ready. 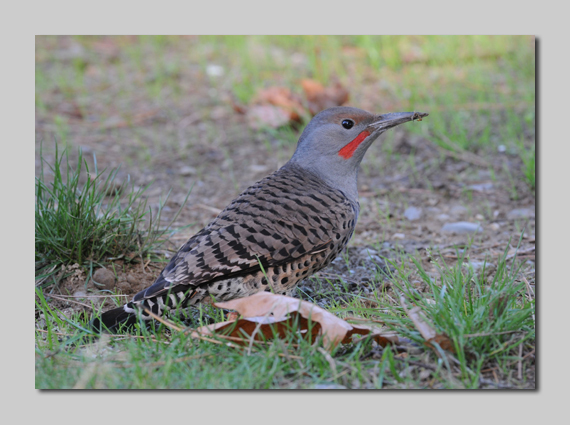 As we parked up on our site Linda spotted a Northern flicker, a large woodpecker for those not in the know! It was nesting in a tree just at the end of our pitch and I got a few shots of its head sticking out of the nest hole. We went on a drive up to Mammoth in the afternoon, then round to tower where we passed the black bear family lazing in a meadow and then on up to Canyon to pick up some more food and drinks. 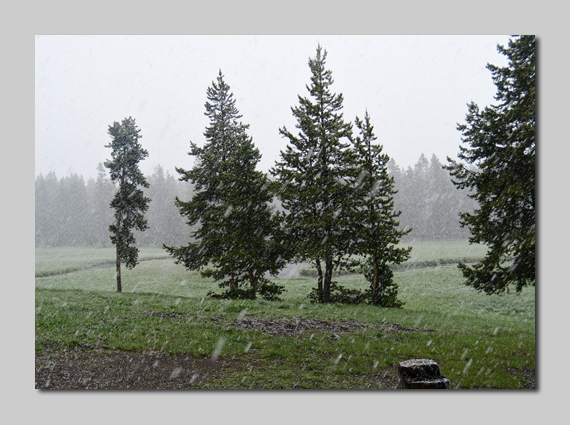 I'd been in shorts and tee shirt all day but it suddenly started to snow as we came through Dunraven Pass and continued into the evening. I had to abandon plans to barbeque and instead ate scrambled eggs in the camper whilst the snow came down heavily and we watched the couple in the next door site struggling to upright their gazebo in the snow. Pleased we aren't tenting like them! Well it snowed on and off all night and was bitterly cold, we're at 7500 feet here at Norris campground and the trees and meadows had a light dusting of snow this morning. as we rounded a bend I saw some people with binoculars and cameras so just managed to slot into a good roadside pull in and we walked up the road some 100 yards to see what was going on. 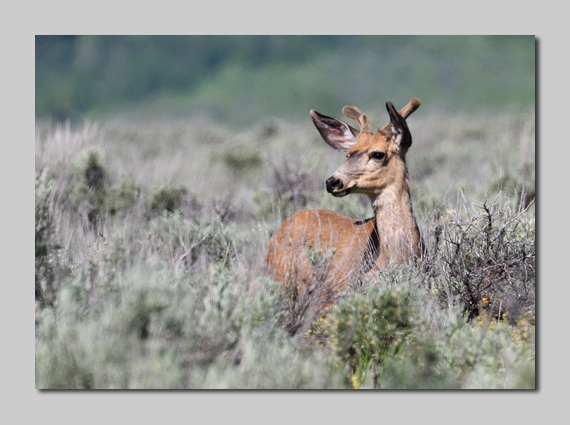 Seems she'd been feasting on an Elk carcass and was now spending time digesting so not a lot of action! Got back to the campground and rustled up 2 huge steaks on the BBQ but had to eat them in the camper as it was still bitterly cold. A Park Ranger called around and told us about a talk he was giving and said that it was going to be below freezing again tonight….13th June! 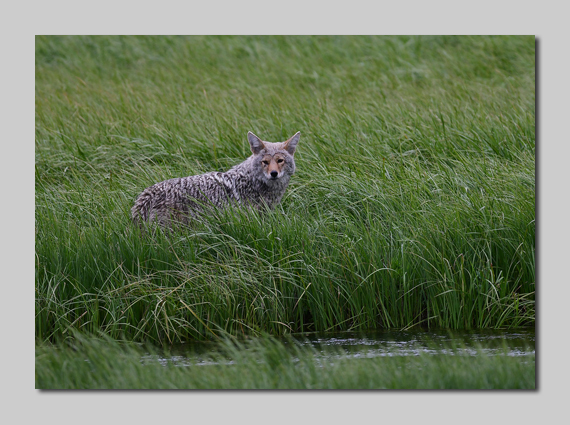 Last evening after I'd updated my blog… there was a Coyote hunting in the meadows directly in front of our campsite. We watched him for about half an hour but still didn't see him catch anything. Took another trip down the Lamar valley this morning but no sign of the wolves we saw a few days back. Plenty of buffalo and a single Coyote that decided it was easier walking in the road instead of the sage brush. I think it was a young one as it looked much smaller than the one at the Norris meadows last evening. I was out early..ish to photograph some Northern Flickers (woodpeckers) which were nesting nearby, in fact I found 3 nests in the campground including one pair in a tree just 20 feet from another nest. Tree Swallows were also nesting in an old woodpecker nest just 1 metre below the Flickers. To be continued down in Western Colorado & Utah..... Red rock country!